Discover the UK and Beyond! Great Britain is comprised of England, Scotland and Wales so you can just imagine how many travel opportunities there are, not to mention the history. Typically, most travelers to Europe will spend some time in London and well they should. However, to miss out on the other parts of England is criminal. The Devon and Cornwall regions of the southwest are magnificent as is the Lake District to the north. The area around Kent is picture perfect and don't forget some of the other major cities which have so much to offer. Edinburgh is a spectacular city with the castle as a backdrop and a trip to the highlands brings out the William Wallace in everyone, not to mention the whisky. From ancient castles to modern cities Scotland has it all. Wales can be the perfect destination for someone who just wants to get away from it all. The Welch still hold on to their traditional culture and language and vacation here can seem like you are going back in time. Enjoy your European vacation with Horizon Club Tours. Another popular European destination is France. Who hasn't thought about a romantic vacation to Paris? Or how about a trip to the French Riviera? France has limitless possibilities. Learn about all the possible options before planning your vacation. Just take Paris, for instance, you could stroll down the Champs D' Elyse and spend the afternoon at a Parisian cafe and then make your way to the Eiffel tower for a beautiful view of the city at night. If the city is not your cup of tea why not try a villa in Provence or do a wine tour in Bordeaux or Champagne. If you like to jet set try Nice in the summer or any of the villages along the Mediterranean coast. The history buff will love a trip to Normandy while the outdoorsman will feel at home in the French alps. I have what you need to plan your vacation to France, just click on the link and discover France. For more facts about Europe check out the individual countries. Germanyhas everything you want in a great destination. Your options are limitless so take the time to explore all of your options. As far as history is concerned who could ask for anything better than Berlin with the Wall and its Nazi past. This is one of Europe's most fascinating cities. Then there is Munich, the capital of Bavaria and the home of Oktoberfest, It's a great city that still has a touch of the past plus the largest urban park in Europe. 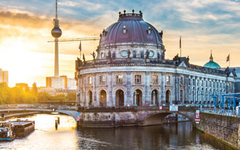 If the cities are not your style the countryside has plenty to offer from cruises down the Rhine to hikes through the Bavarian Alps. Whatever you decide to do you will always want to go back to Germany. Italy has to be the favorite European vacation destination for most people. There are many reasons for its popularity from its wonderful climate to the fantastic food. Italy has something for everyone. In the north you'll find some great skiing and winter sports activities. Along both coasts there are some of Europe's best beaches and resort towns. In Rome you'll get a dose of ancient history and culture. A trip to Florence will bring you back to the renaissance while Venice will bring out the romantic side of anyone. As you move from north to south the character of the country changes with every little village you pass by. These villages make wonderful side trips which open up a whole range of vacation possibilities. I hope the information I provide you with will help you plan your dream trip to Italy. A trip to the Netherlands will be a memorable one. There is so much in this tiny little country which was the home of Rembrandt and Van Gogh. If you're an art lover it doesn't get much better than this. It also has a rich history. For the history buff you can visit many sites related to World War Two. The town of Arnhem was home to the Bridge too far and a visit to Anne Frank House in Amsterdam is a must see. Speaking of Amsterdam, how about a cruise on the charming canals or spending the afternoon at a quaint cafe enjoying a Heineken? The country also has a lot to offer from beautiful cycling trails to the famous windmills. Spain is a vast country with a diverse topography. From the Pyrenees in the north to the beaches of the south you can find everything you would ever want on a vacation in Spain. Most people think of Madrid when they think of Spain. This grand city has a lot to offer and is worth a trip. Barcelona has also become one of Europe's most popular destinations. It is a great city for youthful travelers and it has a fantastic nightlife. The real Spain is in the countryside and small towns along the coast. Here you'll be immersed in Spanish culture and you'll leave fully satisfied with your trip.